At least when you are a senior and have grand kid you can tell them how you lived ceiling-less during The Big One. You find the greatest signs. And you always have your camera ready. How do you do that? I also (along with alf) like the fact that you include fun pictures in quite a number of your posts. I always wonder why some news stories get TONS of attention, and others, that are just as or more deserving, get nuttin'. Glad you have phone service! Just hoping your ceiling is fixed soon. 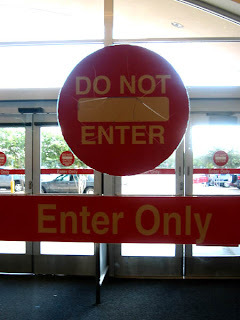 And that Target door? I can just see someone standing there trying to decide what to do. I call it the Home Despot. The media dropped Ike like a last years fad. It's all about the economy now. That's not fair considering that some people are going to be without basic things for a good long time and help is still needed. No clue why some of those people stayed and based on what I saw they are lucky to be alive. Alf - that would be because I carry THIS and looks like THIS. So I always have my camera. :-) Actually, I always have the Guy Who Knows a Song About a Chicken's camera, because mine defected to New Orleans. Thanks Derek! Yeah, too much else going on around the country I guess. Lara - Yeah, if you're a person who has a hard time making decisions anyway, you could spend a good long time at that door couldn't you????????? Ricardo - we can start one of those facebook clubs! The "I hate Home Depot club!" I miss the little hardware store on the corner. At least there if you went looking for some little doohickey the size of your pinky fingernail someone that worked there KNEW if they actually carried the item or not. It hasn't taken a hurricane to teach us this lesson. Here in Phoenix, most houses are less than 20 years old (housing / population boom). We own a 70 year old historic home and forget about finding someone who can work on it. Every contractor we have ever hired (sans one) just declines the job. Their mindset is that they have more than enough work, and if they can't go to home depot to find whatever they need to simply 'fix' or 'upgrade' the issue, they walk away. They don't want to actually have to figure something out and 'work' for a living. Hence, the wife and I have become quite handy at old world repair technics....we have to. I needed a particular I/O card for a computer and asked a clerk at the big computer store for it. He proceeded to tell me why that card didn't exist. I tried explaining it to him again and he again explained why that card could never be found. He made a very convincing argument but I knew he was wrong. I finally said, "See that box on the shelf right behind you. That's the item I'm after." The media dropped Ike like a last years fad. Even in the age of 24/7 news, the media have a tremendous problem with moving on to the next crisis too quickly. I remember what my mother went through after Hurricane Andrew. Her home had minimal damage (she's in North Miami), but she had no power for 6 weeks. It was rough. There have been a few lesser storms since that have knocked her of the grid for 2 & 3 weeks at a time, as well. Not fun. Bruce - Well, if that bathroom is any indication, ya' done good!!!!!!!!!!!!!! You can decorate/repair/renovate my place any ole time! And yes. An old president destroyed my roof. I don't like Ike. And I would like it if they'd fix the roof before it rains next time. Delmer - Why do they DO THAT?!?!?! I just don't understand. I mean, those stores are certainly too large for all but the very most dedicated to know where everything is all of the time, but why on earth can they not just say they have no clue????? Gingersnaps - SIX WEEKS?!?!?!?!?!?!? Wow. I think almost everyone has power back within Houston now, or at least everyone I know personally. Three weeks for some but SIX?!? Did she stay there???? Thanks Carey! Yeah, to me screwdriver, drill what's the difference? Still puts a hole in the wall. But she seemed to think I was committing some crime against power tools the world over. And btw, anyone, that Ray above is actually me. I've been lacking in internet & didn't notice I was pre-signed in on the computer I was borrowing!